Council members Mike Fagan (left) and Kate Burke during the Pledge of Allegiance. In the first two City Council meetings of 2018, newly minted Councilwoman Kate Burke stood during the PLEDGE OF ALLEGIANCE and put her hand over her heart like every other councilmember. But starting at the Jan. 29 meeting, Burke made a subtle change: No hand on her heart. Some observers noticed. In a statement to KHQ last week, Burke stressed that she loved her country and her community, but also that she believed in and respected the "Constitution which calls for the separation of church and state." "And I do not believe it is appropriate to do the pledge from the dais of an official government meeting," she added. Indeed, while Burke recited "so help me God" while being sworn into office in December, she did so on a bound copy of the U.S. Constitution. But in a country where even the Seahawks, according to ESPN reporting, won't let Colin Kaepernick work out with them without assurances he won't kneel during the national anthem, expressions of patriotism remain a cultural flashpoint. 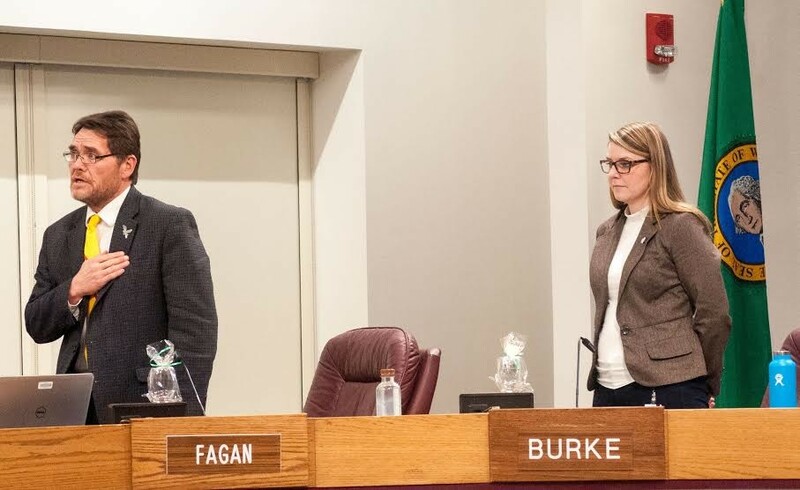 Three citizens during Monday's City Council public forum on Monday spoke about the Pledge of Allegiance, with one person praising Burke's decision and two lamenting it. Ultimately, it's an illustration of the sharp ideological divide in Spokane City Council District 1: While City Councilwoman Kate Burke chooses not to say the Pledge of Allegiance, her deeply conservative seatmate, Councilman Mike Fagan, does.In fact, last year, Fagan angrily called out a member of the Human Rights Commission out from the dais for not standing during the Pledge of Allegiance. "I respect First Amendment rights. But at the same time, respect my First Amendment rights for calling it out," Fagan, a military veteran, told the Inlander last year. Burke, however, declined requests for interviews on the subject from the Inlander, arguing that the controversy wasn't newsworthy.